W M Birchall (American; b.1884). Watercolour signed and dated 1917 and annotated "With the Dover Patrol; SWIFT and BROKE". Plans for the Dover Patrol were set up by the Admiralty in July 1914 as an urgent measure, in the event of war, to prevent German shipping from entering the eastern end of the English Channel and hence gaining access to the wider reaches of the South West Approaches and North Atlantic. It would be a tempting route by which the enemy could transfer his warships and submarines to these sea areas and the Admiralty’s aim was to prevent this by driving the enemy vessels northwards instead where they would have to run the gauntlet of the very much longer passage via the North Sea and around the top of Scotland – where the RN’s Northern Patrol would intercept them. Dover and Dunkirk were the two ports initially used by ships of the Patrol which, as the war progressed, became ever more vital as a barrier to German submarines which were indeed disinclined to use the much longer northern route. By 1917, when this picture is dated, it was one of the Royal Navy’s most important commands and had been reinforced by all manner of warships, armed trawlers, motor launches, submarines, minesweepers, seaplanes. In April 1917 the destroyers HMS SWIFT (Commander A M Peck RN) in the foreground here, and HMS BROKE (Commander E R G Evans RN) were on patrol in the Dover Strait. SWIFT, like so many other warships of the period, was the brainchild of The First Sea Lord, Admiral Jackie Fisher, who wanted new ships that could not only out-gun enemy warships but easily outrun them too: this was to apply across the British fleet from capital ships to torpedo boat destroyers (TBDs) and we see being laid down dreadnought battleships, battlecruisers, fleet submarines, this TBD - all embodying these Fisher's principles. The days of the stately, beautifully elegant, immaculately painted and enamelled man of war were over! Fisher had witnessed Parsons’ TURBINIA showing off her outlandish turn of speed at the 1897 Fleet Review at Spithead and he could see that steam turbines would give him the means to achieve the speed he sought: work was started on plans for a fast, large ocean-going TBD. Eventually – and wholly appropriately – named HMS SWIFT, the new ship, 340 feet long and with 4 shafts delivering, for those times, a staggering 30,000 shaft horsepower, had teething troubles galore from the start and her introduction into service in 1909 was marred with bitter rows between the Admiralty and the builders for SWIFT, at a tad over 35 knots, was not swift enough for Admiral Fisher and was impossibly thirsty on fuel! But in his quest for speed and hitting power some problems were bound to arise and in his usual impeturbable way, Fisher brushed the difficulties aside and forced on with solutions. 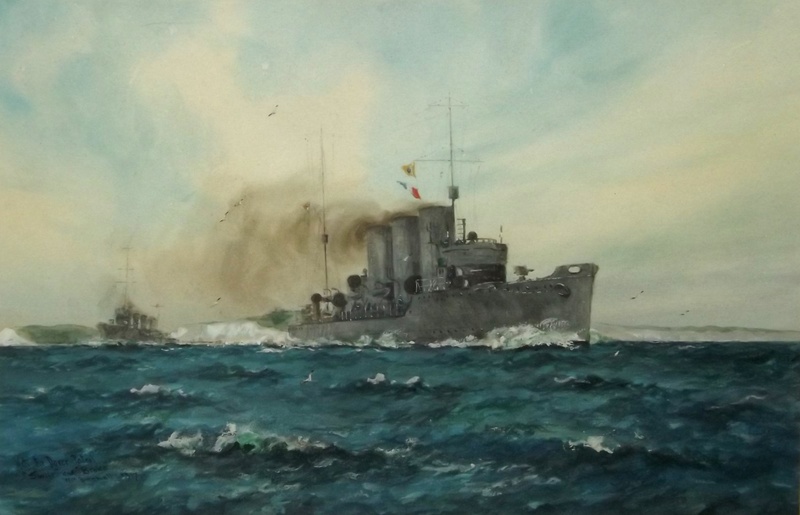 Four 4inch guns (2 forrard, 2 aft) and torpedo tubes were SWIFT's initial armament but by 1916 the two forrard 4 inchers had been replaced by a single 6 inch gun thus making her the only RN destroyer ever mounting such a large calibre weapon (and she was also the only destroyer ever to boast 4 shafts: 2 was the norm!). In contrast to SWIFT, BROKE, painted here astern of SWIFT, was a more conventional destroyer of the Faulknor Class, built by Samuel White at Cowes to order of the Chilean navy and commandered for the RN by the First Lord, Winston Churchill, in August 1914 just as war arrived and she was completing fitting out. Whilst on patrol off the Goodwin Sands on the night of 20th April 1917 SWIFT and BROKE intercepted 6 German destroyers in the Dover Strait and in the ensuing fast moving action both British ships were badly damaged with BROKE audaciously and deliberately ramming into the side of her adversary. At one stage as the two ships were locked together close quarters fighting took place on BROKE’s iron deck before the British TBD managed to pull astern and extract herself, her adversary then sinking. SWIFT meanwhile had managed to sink another of the enemy ships and the remaining 4 withdrew leaving SWIFT and BROKE to limp for home with assistance from other naval vessels. The action became known to an approving British public as the Battle of the Dover Strait and both captains were promptly appointed DSO and lionised by their countrymen who rejoiced in some good news for once, from the war. Teddy Evans, already well known for his exploits in the Antarctic with Captain Scott several years earlier became, as "Evans of the Broke", a much admired naval figure of the Great War.